collecting over 2.5 million wheelie bins each week. in assessing the best way to manage your waste. Our Industrial Services Division provides specialised equipment and services including mechanical, manual and robotic tank cleaning. Do you have used lube oil? J.J. Richards is now collecting used base lube to be recycled into a base lube oil. Did you know that you can now access your service and account details on our specialised Customer Portal and App. 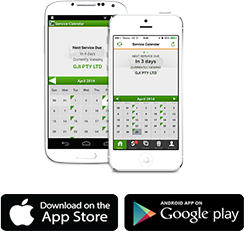 Did you know that you can access your service and account details on our Portal and App. J.J. Richards offers customers a comprehensive range of Total Waste Management Solutions for all their waste needs. We off a comprehensive range of Total Waste Management Solutions for all waste needs. and recycling solutions for its customers. Extensive experience in assessing waste management requirements for the most efficient and cost effective solutions. 85+ years of experience in the waste industry and are wholly Australian owned and operated. The Company has grown through its philosophy of safety, reliability and excellence in customer service. Our commitment to establish and maintain a close, productive working relationship with our customers ensures we provide the most efficient and cost effective service possible.